It doesn’t matter how many triathlons I’ve done—and I’ve lost track of the number—but I still get race-day jitters. Make that race weekend jitters. I start to fear flatting on the bike, swimming through the crowds (I once got strangled by a fellow swimmer and pushed far under water by another), and running with not enough miles or bricks on my legs…as I’m packing my transition bag. The deer in headlights look? That’s totally me come race morning where I’m surprised I have it together enough to set up my transition gear and not forget anything. But as scared, nervous and maybe even confused as I may have been before those triathlons, I’ve survived every one of them. Certainly not all gracefully as I’ve been kicked more times than I’d care to count in the swim, got that flat tire on the bike not once but twice, and felt my legs literally run out of juice when there were miles to go before the finish line. The battle wounds (I kid) may have healed but I still have the finisher medals, the materialistic proof that I survived. 1. Use those race day checklists. Not sure what to pack in your transition bag? Think you’re forgetting an important item? Fleet Feet has a great checklist of what to pack in your race-day bag that covers all the bases. It might have some items that you’d rather leave at home or can’t squeeze into your already stuffed bag, but I still consult that checklist, especially at the beginning of triathlon season, to make sure I don’t forget a race essential. 2. Go with what works for you. I read and re-read so many blogs and articles about nutrition, what to pack in special needs’ bags, and race routes that I was making myself crazy. Sure, I stole ideas from what I read, but in the end, I ended up with a plan that made sense to me and how I raced. If you want to toss on flip flops or Crocs to dash from the swim to T1: Do it. If you want to wear cycling gloves on the bike because you fear slippery fingers: Do it. If you need to sit down in T2 because you’re dizzy or you have to stop in the port-a-potty because you waited hours for your wave to start: Do it. 3. Get a good night’s sleep…two nights before your race. You’re most likely NOT going to sleep well the night before your race—if you do, I’m jealous because I spend most pre-triathlon nights rolling around or waking up every hour. And you’re most likely waking up earlier than you would most mornings, even long run Sundays, to get to the race and set up your transition spot. G to bed early or sleep in the day before your race so you’re not walking around like a zombie come race morning. If you’ve run a marathon, someone has probably uttered along the way that if you can survive training for a marathon, you can survive the actual race. The same holds true for triathlon. If you’ve put in the miles swimming in the lake, the hours on the bike and the repeated brick sessions, whatever coach or your training program has told you to do, you’re ready to go for your race. 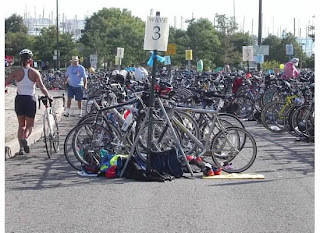 Sure, training doesn’t account for race-day jitters when you’re biking unfamiliar territory on Lake Shore Drive or random farm roads, but knowing that you’ve gone through the motions while training can go a long way during the race, especially during a swim freak-out. OK, so this is a no-brainer, at least in my book. But if I wasn’t having fun while swimming, biking or running then I probably would have quit doing triathlons a long time ago (my parents would be sooo happy about that one, haha). I have my game face on during the swim, I’m a total nervous nelly on the bike (thank goodness I never bought those race pictures to prove it), and I think I look like I’m in pain while running, yet I always come back for more. Now if only I could remember all of these every time I race--something always seems to slip through the cracks, especially the "what works for you" when I'm setting my stuff in transition. As long as I don't try to slip a shirt on in transition, which I stupidly did in both my first and second tris (why didn't I learn the first time? ), I should be good. What advice do you have for surviving a triathlon?